The Iper Hypermarket is part of the new Arese Shopping Center, erected on the old Alfa Romeo car production site that was formerly the cherished workplace of 40,000 workers. Building on this proud heritage, the Arese Shopping Center is the largest shopping centers in Italy and one of the largest in Europe, including 92,000 m2 of Italian market style floor space with more than 200 shops, cafes and restaurants. Sustainability is a key pillar of the building design that is LEED Gold certified, meaning that the center is designed and constructed to use less water and energy and reduce greenhouse gas emissions. “Using CO2 to power the refrigeration system is a perfect match to the intentions of LEED. CO2 is a low-GWP refrigerant and an excellent choice when it comes to reducing greenhouse gas emissions. At the same time, CO2 provides high performance and exceptional properties for heat reclaim,” says Gabriele De Bona, Key Account Manager, Danfoss Italy. Why go for Trans-critical Refrigeration using Ejector Technology? The Iper hypermarket is one of the first stores that implement the new Ejector technology in the trans-critical refrigeration system. Convinced by the results of numerous experiments Ejectors in recent years, Arneg decided to go for the new technology in order to enhance the energy efficiency of the hypermarket. “Electricity for refrigeration makes up 50% of the total energy consumption of the hypermarket, and our customer Iper has an ambition to cut down this consumption year by year as part of their sustainability program. Another ambition of the visionary retailer is to switch to natural refrigerants to cut the carbon footprint. In order to fulfil these goals, we proposed a trans-critical CO2 solution. It is a large installation with several hundred cabinets and cold rooms operating under ambient temperatures up to 38°C”, says Enrico Zambotto, Technical Support Manager from Arneg, a world leader in the production of complete refrigeration solutions for the retail industry. 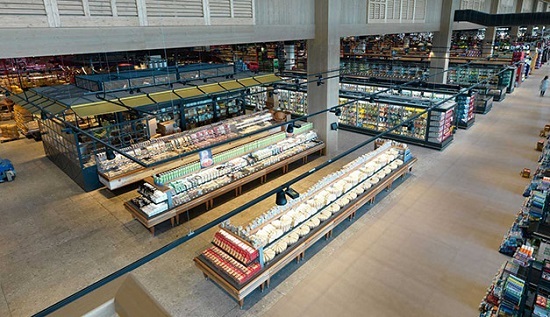 Since the Iper market in Milan was only commissioned in April 2016, it is still too early to provide figures for the actual energy savings of the hypermarket. However, the experience of Danfoss from similar installations with heat recovery, intelligent control and Ejector technology points to energy savings of up to 50% compared to more conventional installations. “With our Smart Store solutions, we can offer energy savings up to 50% depending on the size, location, technology and ambition of the customer. The savings are achieved on all installations from power pack to evaporators and by integrated control of light, HVAC and refrigeration. Our long-term ambition is to lead the development of innovative CO2 solutions and enable net-zero stores or even stores that give more than they take in terms of energy”, says Gabriele De Bona from Danfoss. Ejector is a well-known technology and in close cooperation with SINTEF, Danfoss has devised new ways to use the Ejector technology in refrigeration application to increase the energy efficiency of parallel compression. Today, the current experiments with this new technology return promising results proving the viability of trans-critical CO2 system in warm climates. The Ejector is still in the prototype stage, but the initial trial set-ups in 15 supermarkets across Europe have shown that a simple ejector can significantly increase efficiency of the system. The energy saving potential with Ejectors compared to traditional HFC systems is about 10%. Furthermore, ejectors allow smaller and more compact compressor packs to be installed, reducing the first cost of the installation.